Forecast was for it to be fairly windy in the morning then drop off in the afternoon but that was definitely wrong as the breeze built in the afternoon. Bit of a panic before the start when Robin called to say there wasn't a 07:15 ferry so we would have to pick him up just 15 minutes before the start but as it turned out we were on the line by the 10 minute gun. Good start at the pin end with Raffles kindly giving us enough room to get round Gurnard then off to the Forts. 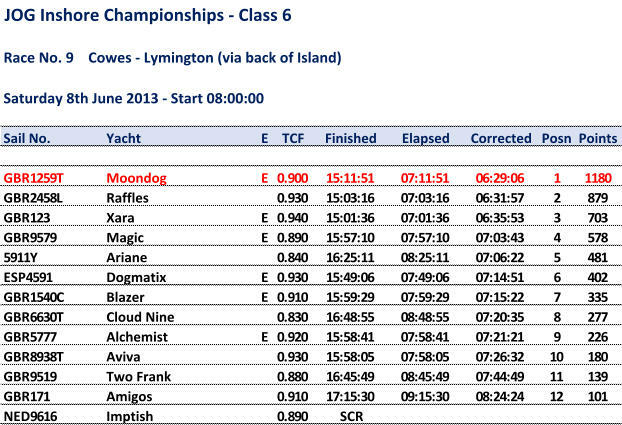 Once past Cowes it was a single tack to No Mans Land and Raffles and Xara did not get too far ahead with the rest of the fleet behind us. Headsail change to the No. 1 as the breeze dropped a bit and once through the Forts we eased sheets. Blazer was the first to put a kite up and started to go past us. We were a bit more conservative and held out till we could hold our full size kite but even so it was a bit hairy till we got to Bembridge and we turned onto a better angle. Bit of discussion as to whether we should follow the rest of the fleet into Sandown Bay but decided to stay out in the adverse tide with the better wind and potential surfing conditions. This did not pay as the back eddy out of the bay really lifted the boats in there but we didn't loose out too much to Blazer who came out in front of us. Just before rounding St Cats we dropped the kite as we did not want to get into trouble once round and for some other boats that proved to be the case so closed up on Blazer in the process. Good run down to Bridge but had to change down to the No. 3 for the beat up to Hurst. Tacked up the shore under the cliffs with some very helpful bigger boats showing us how far it was safe to go in. Coming up to Hurst (strong tide against) we looked at what the other boats were doing and decided to go as far into Port Albert in the slack tide before heading out into the current. Really good move as we got across in one with no difficulty what so ever, unfortunately not so good for Blazer as they attacked Hurst from the middle of the steam and went from 100 yards ahead of us to 48 minutes behind by the finish. Once through Hurst it was about a two & half mile beat to the finish tacking up the mainland shore to keep out of the worst of the tide. Saw Xara finish and thought we had our time on them but wasn't sure how far Raffles was ahead so thought we were on the podium but very pleased with a first and by a reasonable margin in the end. Celebratory curry in the excellent Cowes Tandoori with with Colin and crew for a in depth de-brief and possibly a little gloating.